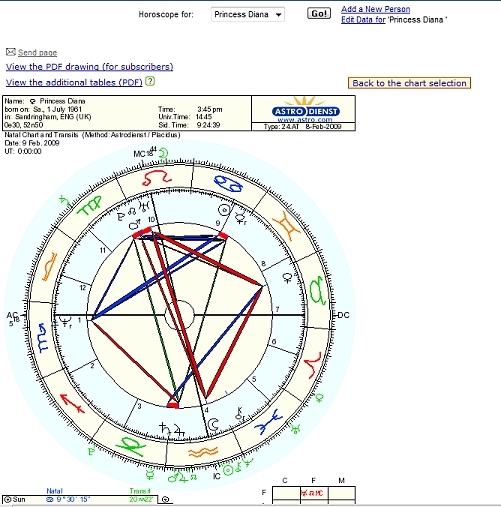 Where is the Lunar Eclipse or Solar Eclipse in my Chart? Many people ask how to find the eclipse's transit relative to their birth chart. They want to know where the eclipse is hitting (transiting). This is not a difficult thing to do IF the person knows three important pieces of information. If you have to guess at any one of these, your computation won't be accurate. 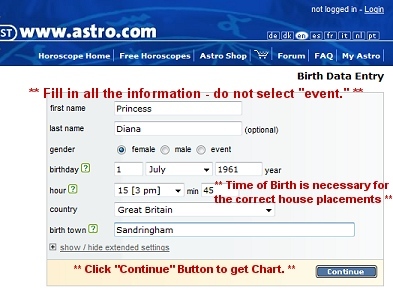 First, you will need your date of birth; day, month and year. Next you need your time of birth. Be sure to distinguish between a.m. and p.m. 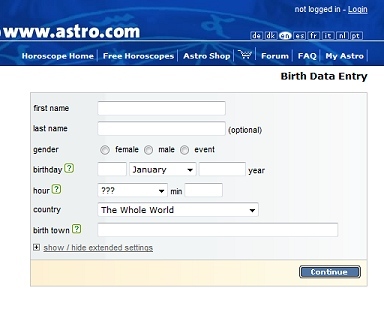 Finally, you need your location of birth. Most chart services have an extensive atlas available listing 95% of the cities, towns and even some villages across the world. If your place of birth is not on the list, select a town that is as close to your birth place as possible within a 25 - 50 mile radius of your birth place. Learn more about the astrology factor of the Eclipses in relation to your natal chart. What's an Eclipse? Learn more about Solar (Sun) Eclipses and Lunar (Moon) Eclipses. At the top of this example page I have inserted a pink arrow showing where to click. 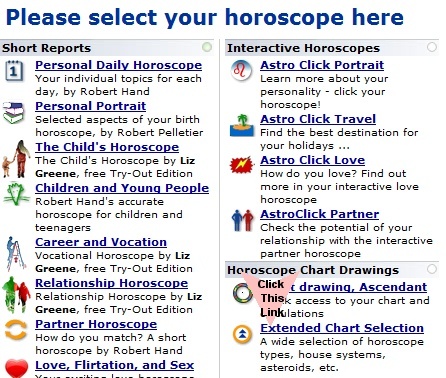 On the real home page, at Astrodienst, click on the "Free Horoscopes" link to proceed. You should not need to create an account or log in to get a chart. 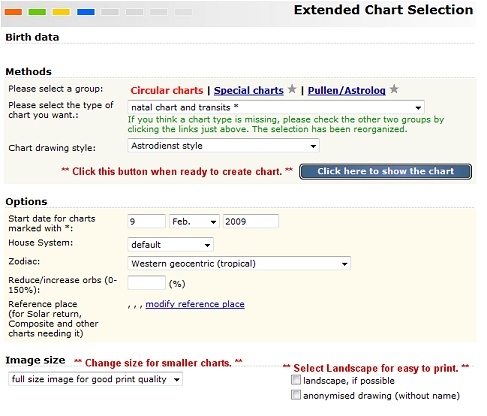 On the Astrodienst site's page, click on the "Extended Chart Selection." 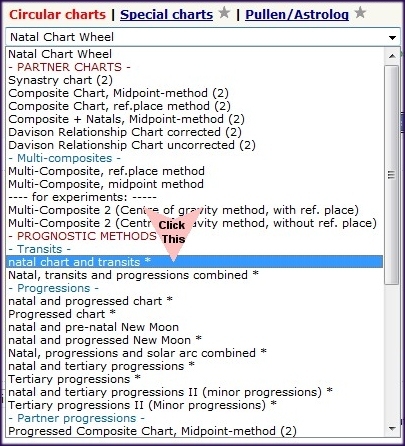 Locate the dropdown window under the term "circular chart." 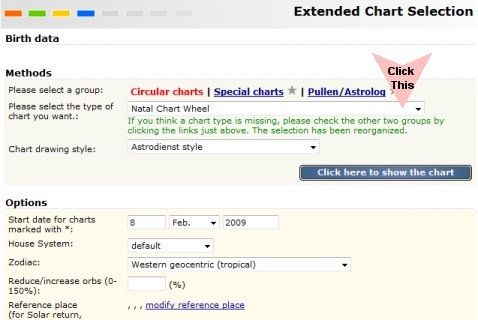 On the Astrodienst page, click on the dropdown choice for the type of chart you want. You will want to select the natal chart and transits option. 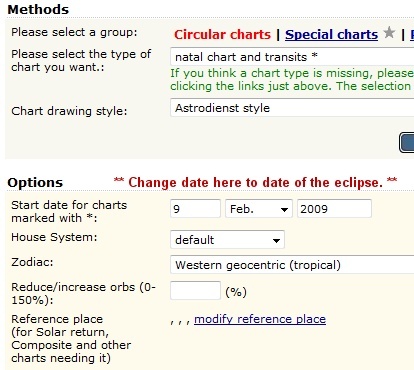 Under Options, next to the "Start date for the charts...," you will want to change the date to the day of the eclipse. As you scroll down the Extended Chart Selection page at Astrodienst, you will also see other options. You can always come back to these options to make changes. I usually make the chart smaller for easier to print charts. The landscape option also helps makes charts easier to print and read. When you are ready to create your chart, click on the button "Click here to show the chart." 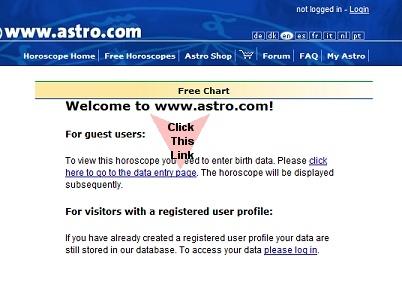 On the Astrodienst page, click on the first link for Guest Users if you do not have an account with Astrodienst. You can always create an account later if you decide you want to save your information. On the Astrodienst page, this is the most important part. Accuracy on this data gives you the best results. As noted on the example, do not select "event" for the gender option. Hour and Minutes as well as birth country and birth town are necessary for correct House placements. When all the information is added into this form, click the button "Continue." 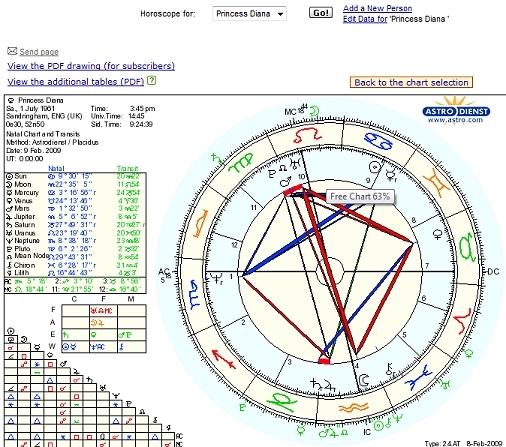 On the Astrodienst site, this is how your chart with transits will look. The planet glyphs in green around the outside of the circle are the transiting planets. For the Eclipses, we will only need the Sun and Moon (mostly the Sun). From the outside, inward, the first outer layer of the circle with the zodiac glyphs are the astrological signs, 30 degrees each. The next layer inward are the natal houses and planets. The house size can vary from about 10 degrees to about 60 degrees, depending on the birth data entered. So don't be upset if you see some really small houses and then some really large houses. The inner layer are the natal aspects between planets. We don't need to worry about those aspects for this instruction. BUT, since I know people are going to ask; Red are the squares and oppositions, Blue are the sextiles and trines, Dark Green is inconjunct or quincunx. Now that we have a chart, we have the information that tells us what we want to know (or close to telling us). To the left (on the example image above), in red I show you what the Sun and Moon glyphs look like. We are looking for the green ones located outside of the chart. I also put the numbers of the houses in red to help make that more clear. At the top of the chart, I typed "Transiting Moon" and at the bottom is "Transiting Sun" to show the Lunar Eclipse. On these transit charts, the time is computed by the server system, so the time of the chart may not match up with the time of the eclipse. The Moon can move approximately 13 degrees in a day. But the Sun will only move about 1 degree in a day. So rely on the Sun being closer to accurate than the Moon. For a Lunar Eclipse, the Transiting Moon will oppose the Transiting Sun in the opposite sign and at the same degree. 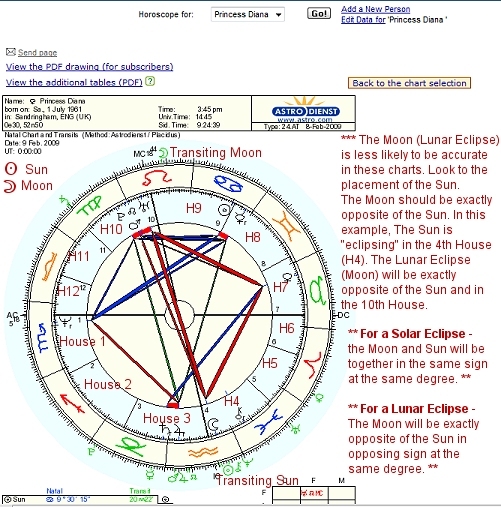 In this example, the Lunar Eclipse Sun is transiting the 4th house yet the Moon is in the 9th house. The 9th house does not oppose the 4th, so we know that the Moon has not yet made it to the state of being a Lunar Eclipse. For the correct reading, the Lunar Eclipse Moon should be transiting the 10th house. My point being - rely on the Sun to find where the Moon should be. The landscape version makes it easier to see all the details; the birth data, the transit date, the natal and transit planet locations, the degrees of the houses, and more. The choice of layout is yours based on what is easier for you. So there you have it. The free service by Astrodienst is great! © J McCaul - Please do not copy these instructions onto other websites without first obtaining my written permission. You may contact me through Lunar Living email/contact page. Thanks!